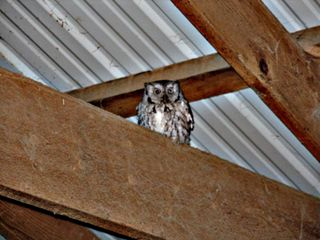 During "night stables", Gregg found this owlish little visitor above Hobbes' stall. I've been wondering where all the mice were this winter. Now, I think I know. Our property, located on the city-county line, is an urban island for wildlife. The last appearance was by a mountain lion, but we have hosted a little of everything.